If you are driving 30 down this curvy stretch of mansion-lined Ponce de Leon, they look are peas in a pod. Individually these century old mansions are extraordinary. They predate all but the earliest Buckhead estates. Four Ponce de Leon Mansions have churches. Or do the churches have mansions? This 1916 Candler Mansion is now St. John Chrysostom Melkite Church. Who was the architect? How many Candler mansions are there anyway? This is probably my favorite. See the big picture for a definition of high-style gorgious. This is Pinebloom Mansion by Walter T. Downing, built in 1914 for Preston S. Arkwright, president of Georgia Railway & Power Company. The church is now home to Jackson Hill Baptist Church and Veritas Church. The Baptist Hour radio program was broadcast from the attic studio beginning in 1941. Click here for close up of Pinebloom. Did you know we have a mansion named Stonehenge? It was designed in 1914 by Edward Bennett Dougherty for Sam H. Venable one of the largest quarry operators in Stone Mountain. St0nehenge is now part of St. John's Lutheran Church, the oldest Lutheran church in Atlanta. I don't know for sure about this last connection. Druid Hills Methodist Church itself is by Ivey and Crook. That's good enough in by itself. Next door is Green Gables, at least that's what I'm calling it. It's for rent. I hope the learn more and perhaps visit these some day. Digging up the details is more than I can handle right now. This post is a place holder for another project. This was an interesting post on houses/churches. I just did a post earlier this week on church architecture. Stop by and take a look: /graciousinteriors.blogspot.com/2010/04/buildings-befitting-beliefs.html. Love all of these houses/churches. I used to ride my bike past them when my parents lived in the neighborhood. Always had to stop and look. 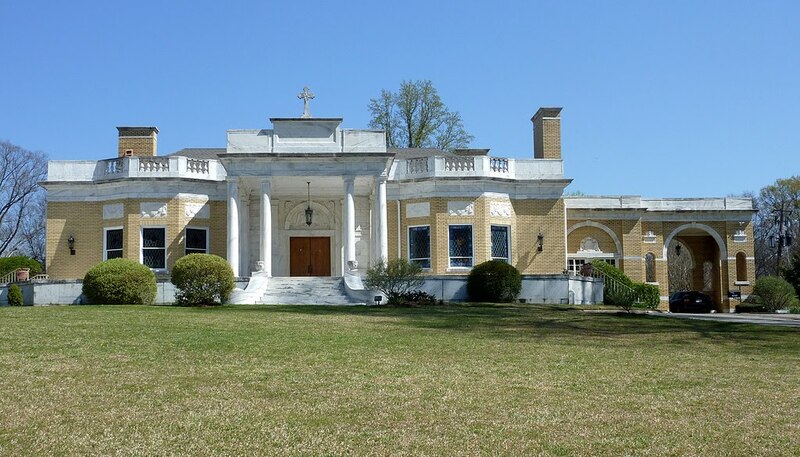 Did you know that the Candler mansion that is now the Melkite church has an indoor pool in the middle of it with a skylight over it? They have the pool covered now that it's a church. Apparently it was amazing when it was in use. All of the rooms/halls came off of that central area with the pool. Learned all of that on the Neel Reid walking tour I went on a while ago. I always wish I could step back in time when they were building these beauties. The stonework on the "Stonehenge" building is stunning. I must confess that I always thought I was odd because of my deep fascination with architecture that no one in my circle of family or friends shared, but through blogs, I've come to know that I'm not strange at all, but rather they are! Just kidding. Nice post, Terry. Thank you for the information on the Pinebloom. My family was a member of the church and I spent the first 10 years of my life there....What a beautiful place...it was and still is magical. I would love to know the history of the family that lived there. Mothers' Day on the porch is not for the serious.